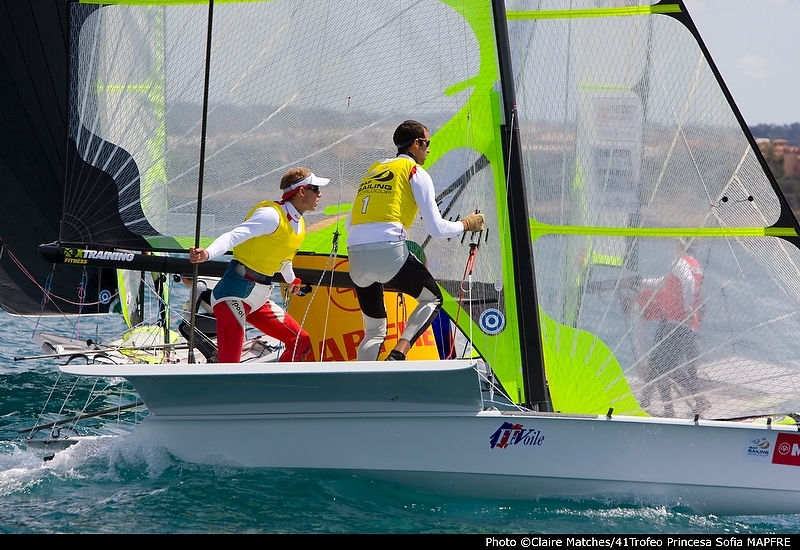 Apparently, in this sailing thing, the more it hurts, the better it gets. Eventually. Hand it to the organizers of the Clipper Round the World race, they are enablers of the first order. I don’t much care who wins this deal, but sailing around the world is sailing around the world. Clipper 2009-10 is better than halfway around—they’re due back in Britain in July—and I was running a contact high on the conversation. Meaning, on one occasion, a 200-mile swath of 60+ knots. 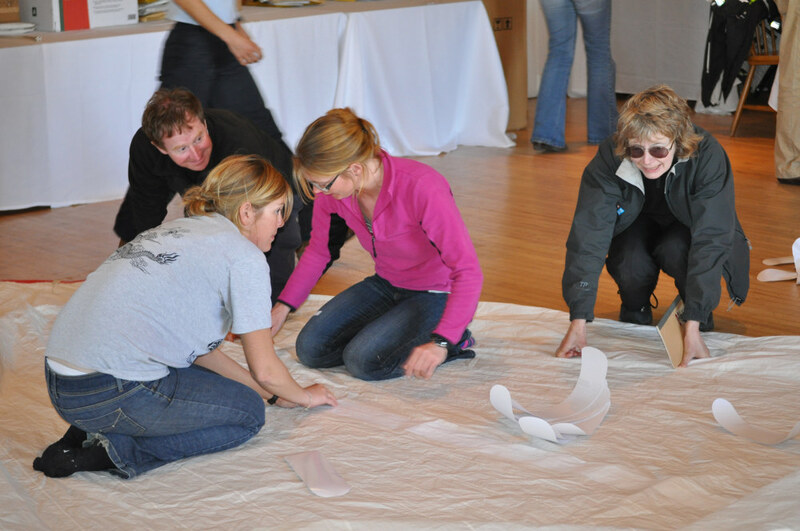 A crew that includes a farmer, a banker, a student, a physiotherapist, a physician . . .
As Easter Sunday dawned four of the nine remaining Clipper boats had arrived at the San Francisco Marina (one of the original ten was left on a reef between Singapore and Qingdao; it’s replacement will meet the fleet on the eastern side of the Panama Canal). 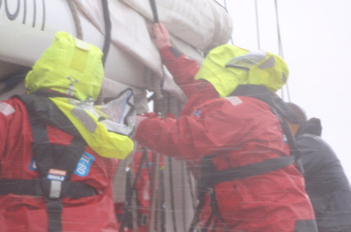 In port, the pay-to-play crews and the professional skippers, one per boat, were energetically going through the innards, making fixes, cleaning up, and airing things out as well as they could in changeable and sometimes wet weather. 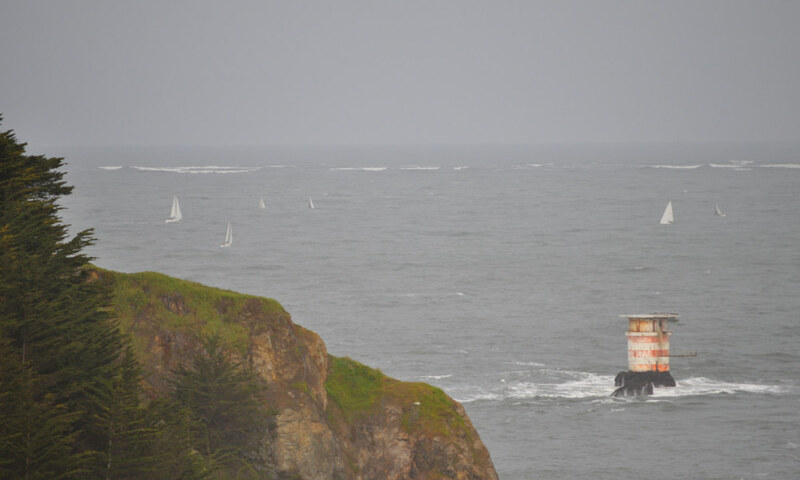 There was an afternoon downpour that washed ducks out of ponds, then a break as darkness fell and four more boats had their moment to sail under the Golden Gate Bridge, into San Francisco Bay. 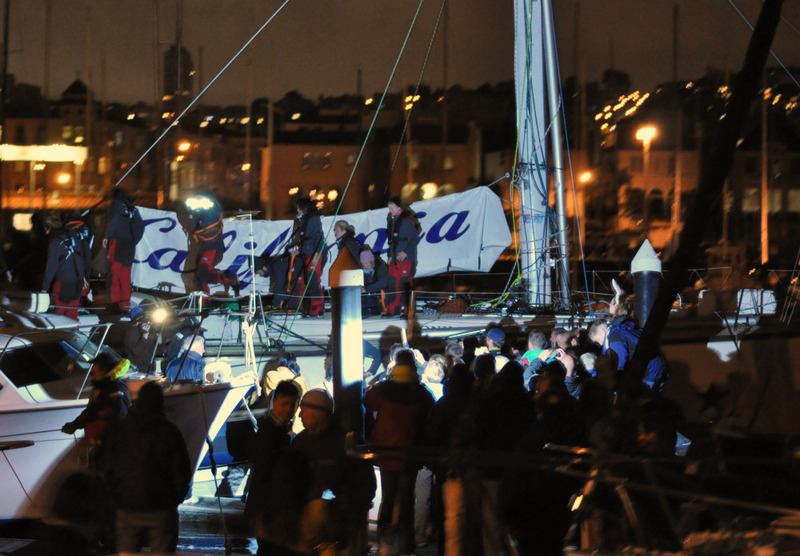 Spirit of Australia, Hull & Humber and Edinburgh Inspiring Capital were bunched because they were the last of the relay team escorting California, which broke its mast in a knockdown on March 21. The crew decided it was harder to turn back than to go forward. Other boats have escorted, transferring fuel to California in difficult conditions, and I suggest you read my words, “transferring fuel to California in difficult conditions,” with your imagination switched on. This has been hard. 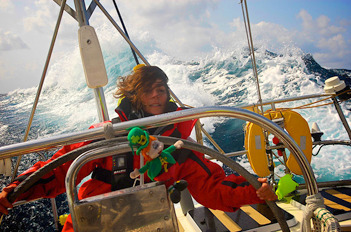 And picture spending the last two weeks motoring a sailboat through rough seas. The motion must have been horrific, not to mention handling diesel. Out of deference to travail, California was allowed first-entry to the harbor, whose entrance has re-silted and narrowed since being dredged for the 2009 Rolex Big Boat Series. The air was biting, cold and misty as California motored (ugh) in . . .
A new mast awaits installation and tuning. Meanwhile, Team Finland is still 2,500 miles out after losing its rig on the Singapore-Qingdao leg and departing China two weeks behind the fleet. The scheduled April 11 start from San Francisco for Jamaica has been set back to, probably, April 16, to give Team Finland five minutes in port before it’s time to go back to sea. 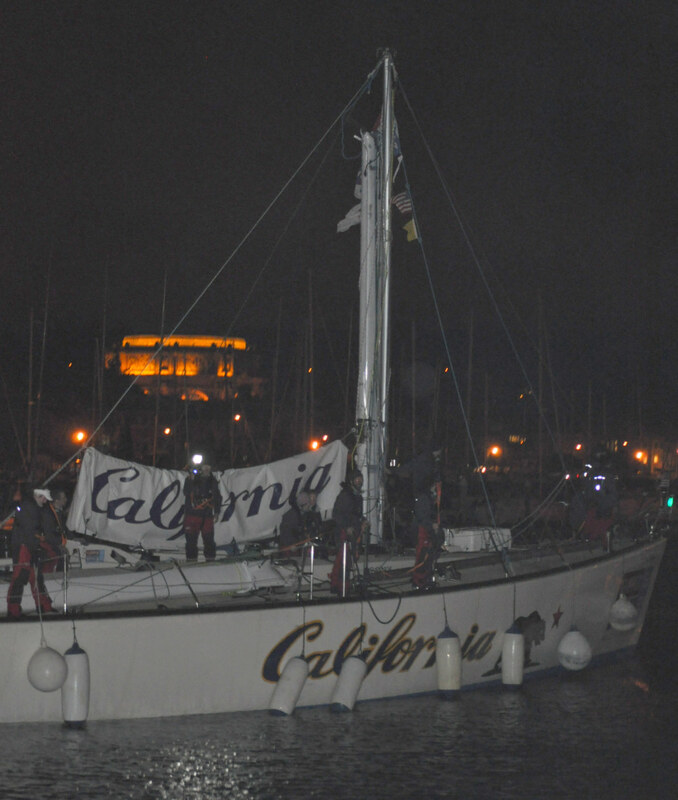 Every boat had a crowd to greet it, braving the elements, but California was the special story . . . The Clipper Round the World includes a Southern Ocean leg after turning the corner at Cape Town, but it was nothing to compare to this. 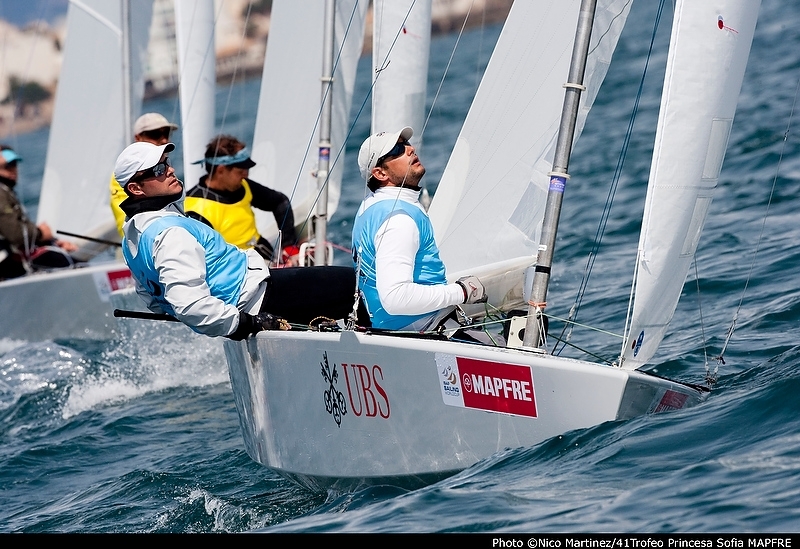 Two views of the 41st edition of the ISAF Trofeo Princesa Sofia Mapfre for Olympic classes, completed in Palma de Mallorca. 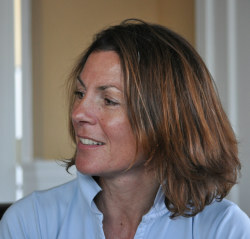 The top dog among the winners was Italian windsurfer Alessandra Sensini, dominating the women’s division of the RS:X. To Bill Quigley, for building a fast Farrier-designed trimaran, Tatiana, and to the two men who brought it home first in the Doublehanded Farallones Race, sailed out of the Golden Gate over the weekend—the same waters where the Clipper Round the World race boats are completing their long journey from China. The start was slow, but the ocean was serious. There’s a channel leading out to the left, and that’s the San Francisco Bar—aka the Potato Patch Shoal—breaking in the background. If I had been patient, I could have caught bigger breakers. The Doublehanded Farallones is 58 miles plus tacks. Tatiana made the outbound and return in about 6.5 hours. 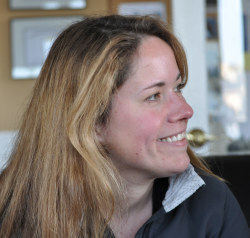 At the skippers’ meeting the week before—the race is run by the Bay Area Multihull Association—Clifford Shaw was awarded US Sailing’s Arthur B. Hansom honors for his rescue of two sailors in the 2008 version of the race. Luc de Faymoreau and Disun Den Daas aboard the former’s Olson 40, Pterodactyl, were swept off the boat by what they described as a “freak wave.” Shaw, who was shadowing the race on his Crowther 36, Rainbow, saw the Olson begin to act erratically and went to investigate, pulling the two men aboard in 15-foot seas. I reckon that may have been less automatic than I just made it sound.